They Came to a City: what happened to wartime Utopianism? Last week we we saw the film of J.B. Priestley’s They Came to a City shown by the BFI as part of their season of Ealing Studios films. As entertainment the film lacked a certain something, but as a political and historical document it is of real interest. It reflects the wartime desire of many Britons to build a better society once the war was over – as a sort of quid pro quo for pulling together as part of the war effort. Does this have anything to say to us now? 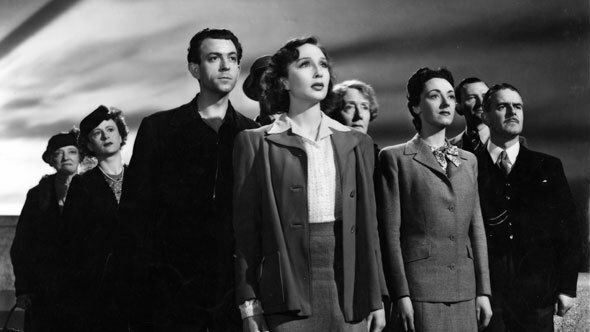 The film, made in 1944 from a play produced in 1942, transports nine people drawn from across British society to a Utopian city, where life follows the Priestley’s distinctly socialist vision of the way life should be. We don’t see the city itself, merely the reactions of these individuals to it: they are offered the choice of staying or returning to current society. The film only offers hints of what this ideal society is. Back in the 1940s people probably had a better idea about it than we do now. It is an egalitarian society where people are focused on well-being rather than possessions, cooperate rather than compete and “do an honest job for the community for what the community thinks we’re worth,” to quote a later Priestley work. People are happy, and capitalism, or its prewar incarnation, is banished. The three working class characters, including the two principals, all like this vision and want to stay – or promote its ideals in the real world. The capitalist plutocrat hates it: he is told that what he does for a living is criminal there. Two of the three aristocrats also reject the city, for similarly predictable reasons: the male character giving a little speech about how he didn’t really like to have to deal with people at all. The middle class couple is split. The bank manager husband is keen to throw off the oppressive stupidity of his organisation; his rather neurotic wife is horrified: she wants a garden and children of her own, and doesn’t want to mix with “common” people. The film is making two distinct points here. First is that many people want this ideal society but are convinced that it is impossible or impractical to achieve, and so do not strive for it. It is important to inspire such people with the hope that it is possible: which is what the thought experiment of the city does, and gives rise to film’s messianic conclusion. The second is that the ideal society will be disliked by many people, and not just those at the top of society. At all levels people pin their hopes on a vision based on the way society is: material possessions, status and so forth, and so resist changes to the way society works. The opposite is also true, of course: some of the upper echelons of society will be as anxious for liberation as anybody else, represented in this film by the upper class daughter who breaks from her mother to stay in the city. How does this look now? The first reaction is to think that all the hopes have come to nothing, and that we are reduced to the cynicism that Priestley was so anxious to combat. Putocrats flaunt their wealth; capitalist competition drives most of the economy; people remain obsessed with possessions and status. Utopianism is dismissed as impractical. You can imagine Priestley preaching to us today with the same fervour. But that’s a glass half empty view. Since 1945 much of the socialist vision has come to pass. Social security, the National Health Service and free education are now all accepted foundations of modern society. The proportion of economic activity not driven by competition: government administration and services mainly, is much higher than the pre-war level. Even a shadowy idea of competition within the NHS is bitterly contested, with most people instinctively against. Class distinctions may be persistent, but they are a faint shadow of what they were. The overwhelming majority of Britons would identify with the (rather articulate) working class characters in this film, who seem distinctly middle class to us. The aristocracy is an irrelevance. The middle class characters look hopelessly outdated. Apart from the working class characters only the plutocrat remains of our time – and he is a figure of humble origins made good. And poverty of the sort taken for granted before the war has been largely banished – and people are much happier in all sorts of ways. But it is not our way to reflect on these gains. However close we get to utopia it always seems an infinite distance away.